Energy waster. 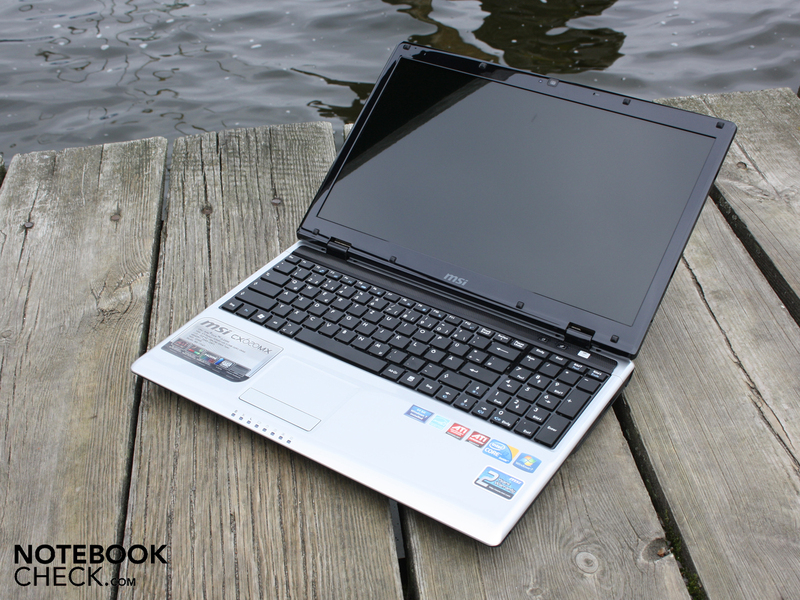 GPU Boost with ATI HD 545V, eSATA and rear interfaces allow this affordable 15.6 inch notebook to raise the interest of several buyers. Will occasional gamers also be satisfied? Do the hybrid-graphics extend the battery life? 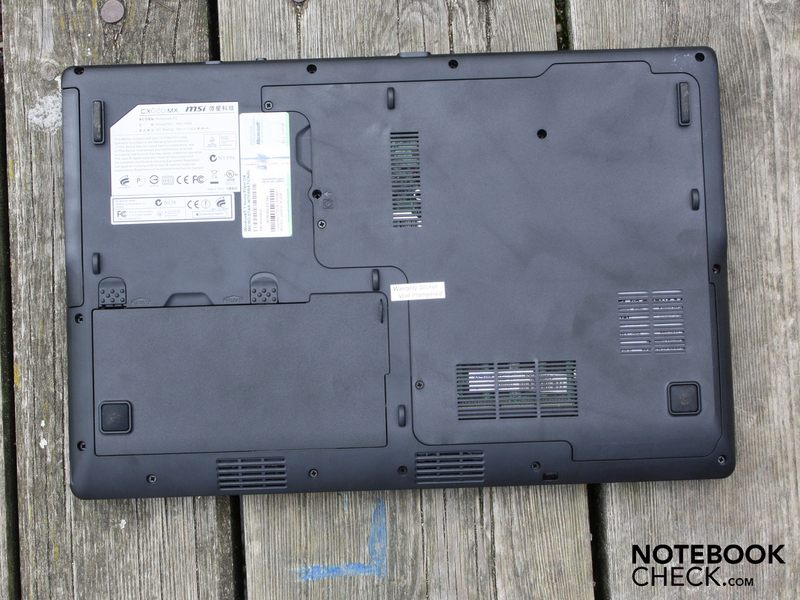 We searched the market for the most affordable Core i3 notebook, and found the Lenovo (IdeaPad G560), and the Fujistu (LifeBook A530). These are simple office notebooks that cost about 500 Euros and do not have any additional niceties, such as a dedicated graphics solution. But what if people with tight purse strings also want to play games from time to time? These target customers do not have to look on eBay for second hand devices, but can consider notebooks such as the MSI CX620MX-i3343W7P, or the HP G62-130EG. For under 600 Euros, these contain a small dedicated graphics card from ATI. In comparison to the ATI Mobility Radeon HD 5430 in the HP G62, the ATI HD 545v in the CX620MX sounds much more interesting. 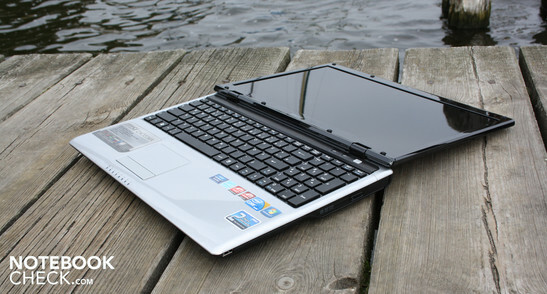 It has 512MB DDR3 video memory, and can be disabled (hybrid-graphics with Intel HD). 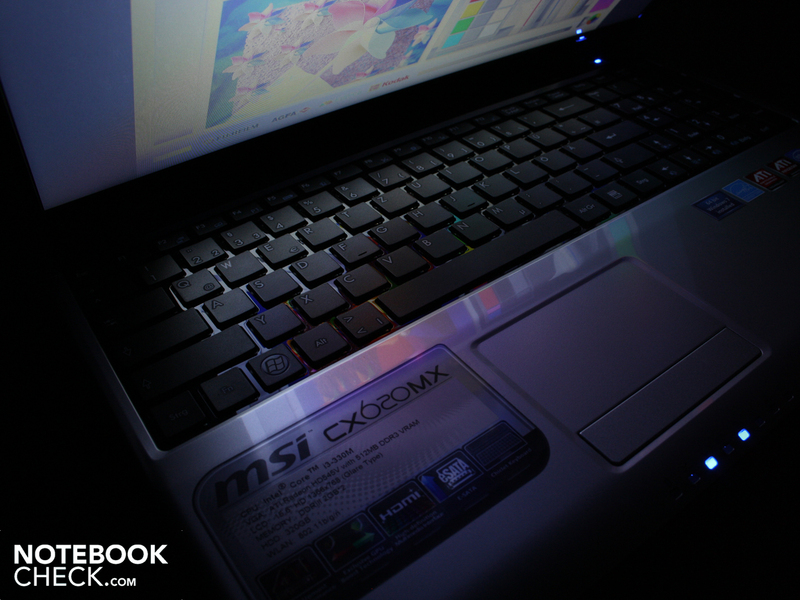 In addition, the MSI laptop has HDMI, eSATA, and ExpressCard34 interfaces. 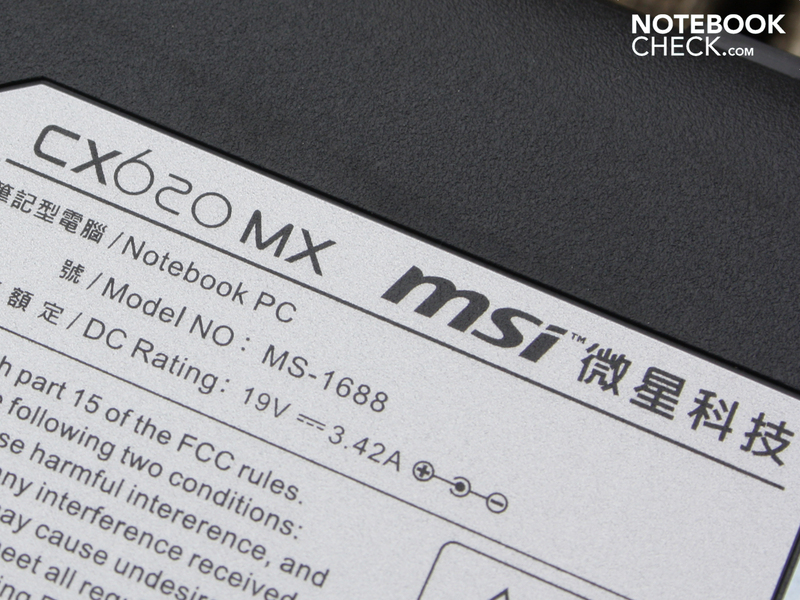 Discover in this test, whether the MSI CX620MX is suitable as an all-rounder, which can be used to occasionally play games. Also find out why it has earned the title as energy waster in our eyes. There seems to be some sort of secret surrounding the MSI CX620MX. At least we were not able to find any images on the internet, that resembled our tested device optically. Instead, we almost always found photographs of its sister-model, the CR620, in online shops. This is similar when it comes to the shape and the location of the interfaces, but the pattern of lines on the palm resting area, and on the lid, are not on the CX620MX. 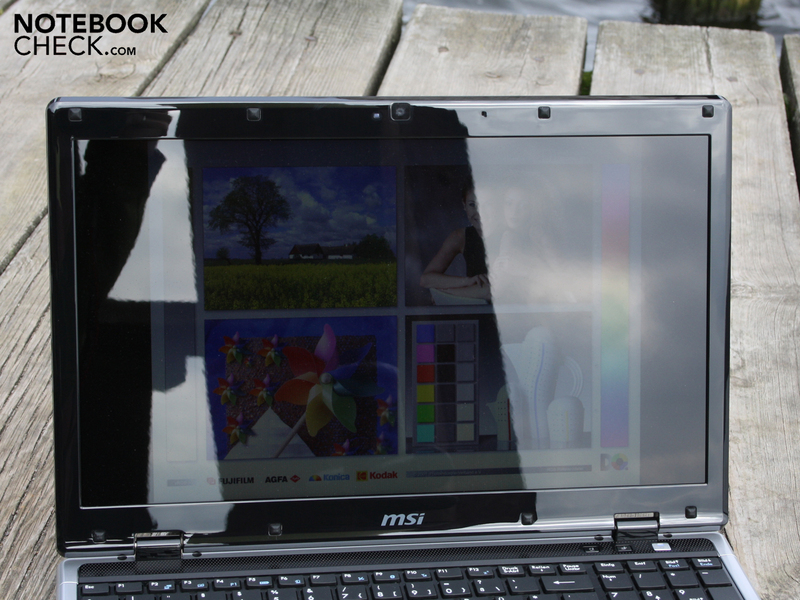 Even the official MSI product website shows a 15.6 inch notebook with the chipmunk look. Potential buyers will unpack a black and silver notebook at home, that makes due without any lines or similar patterns. 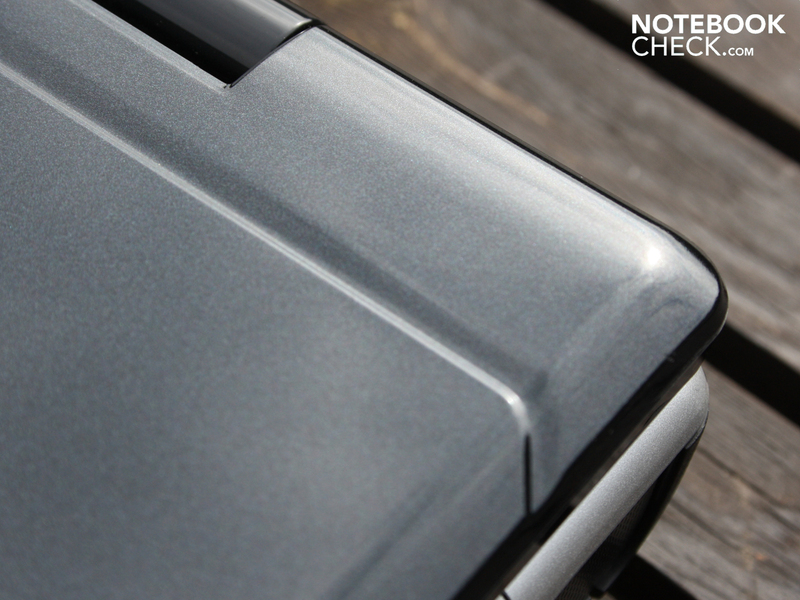 The lid has a black glossy surface that shines with a slightly metallic look, and appears to be the most scratch sensitive area on the notebook. The surface of the lid reacts to pressure and bending easily. The hinges hold the heavy lid securely, and completely prevent any teetering of the lid. The hinges sit firmly in the case. The maximum opening angle is a gigantic 185 degrees. The manufacturer has foregone the addition of a logo for cost saving reasons. The emblem is only applied to the display lid. The large case has a good pressure resistance around the working area. The keyboard does however bend in marginally, and this also applies to the large area of the base plate. 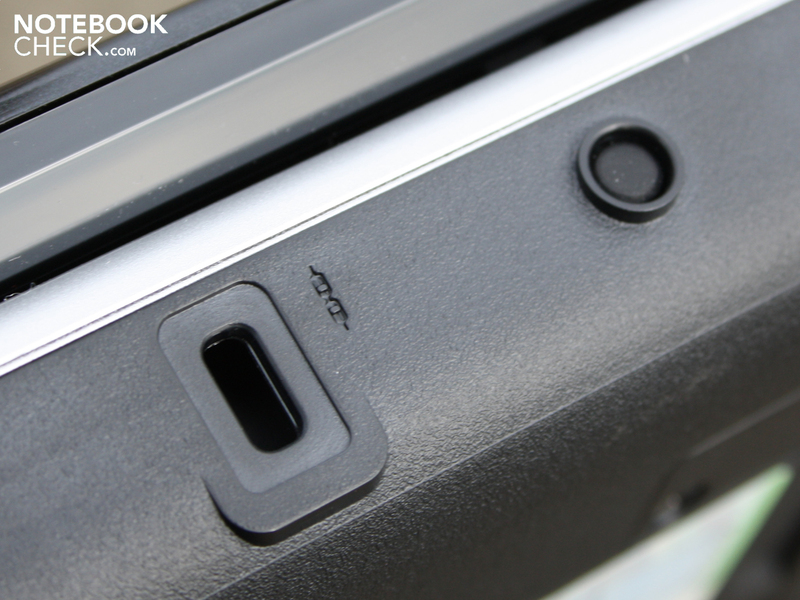 The area around the optical drive, and the middle air vent, can be dented inwards. 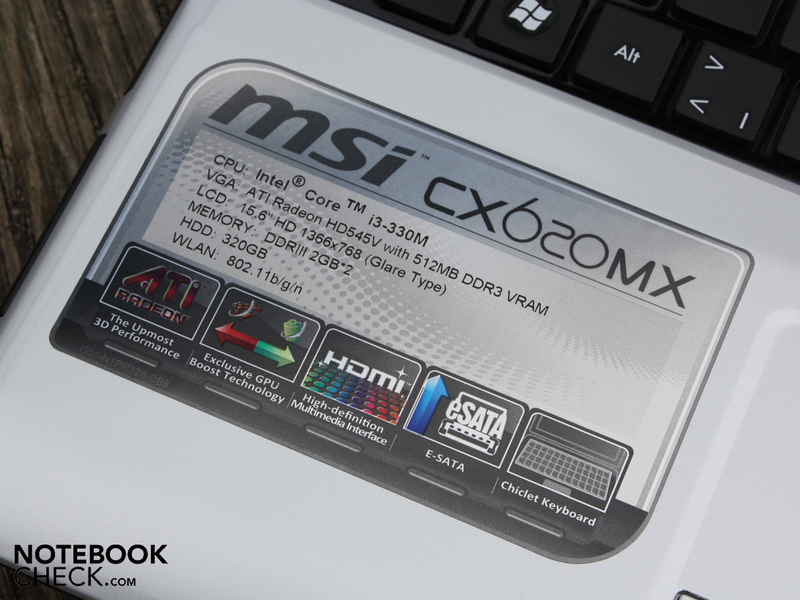 Those that opt to choose the MSI CX620MX, will get all the interfaces that a good all-rounder should have. At first glance the left and right sides appear bleak, since there is only one USB port (right) and Ethernet, ExpressCard34, Cardreader, and Audio socket (left). 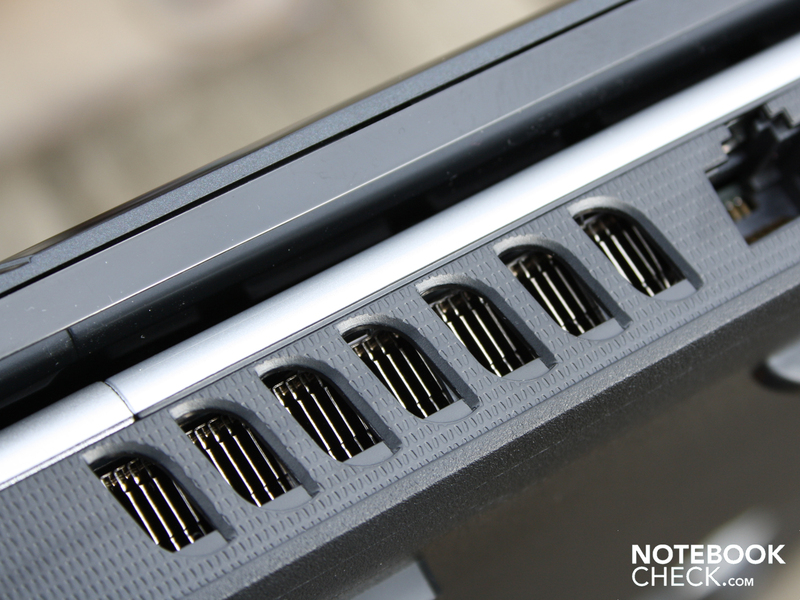 MSI adopts the old laptop tradition and has put all the useful interfaces on the rear side. The high sitting hinges, and the battery located under the palm resting area make this luxury possible. At the rear of the notebook is the obligatory VGA interface for an external TFT, HDMI for a television, and two USB 2.0 ports for peripheral devices. The last of these is also combined with an eSATA port. Almost a highlight in this price class is the ExpressCard34 slot for expansion cards. Those that need more interfaces, e.g. USB 3.0 or FireWire, can get the appropriate card for the ExpressCard34 slot. 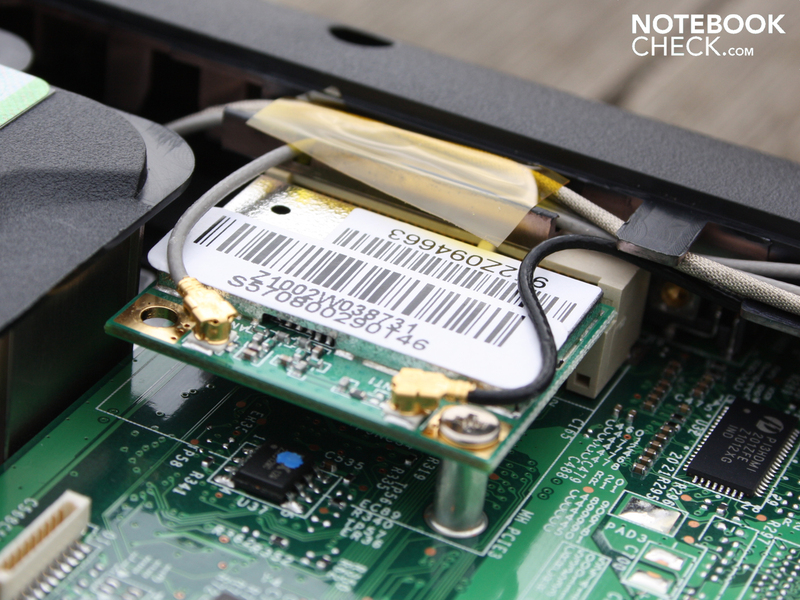 The WiFi module is an Atheros AR9285 802.11n (120-240 Mbit), and supports the most current WiFi standard DraftN. Bluetooth is also on board. Those that prefer using a cable solution, have a maximum bandwidth of 1000 MBit/s available. The Realtek Ethernet adapter supports Gigabit Ethernet. MSI provides only a driver CD as an additional media. The included Windows 7 Home Premium 64-bit recovery DVDs have to be burned by the users themselves. 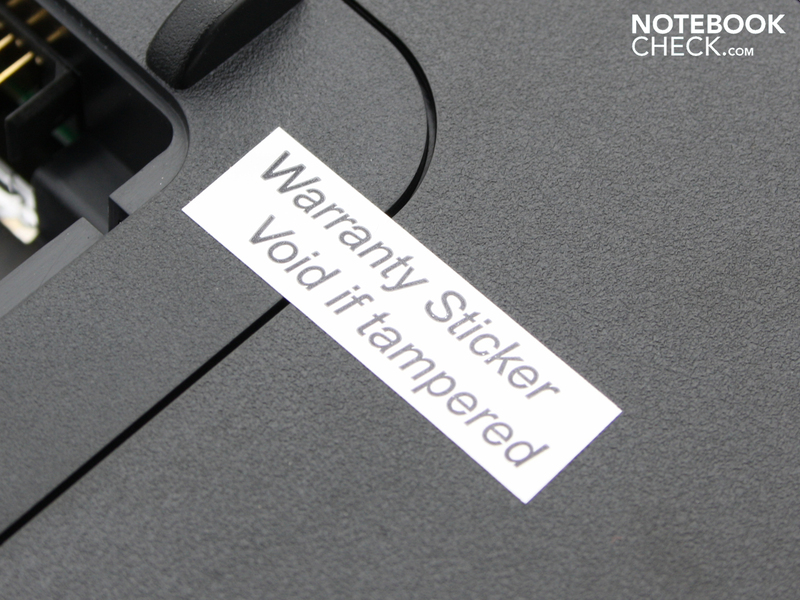 The delivered items contain no more than a warranty card, and a quick-start manual. The hard disk contains few pre-installed programs and tools. One program for the webcam, Corel WinDVD2010 (player), and the obligatory MS Office 2007 as a 60 day trial version. 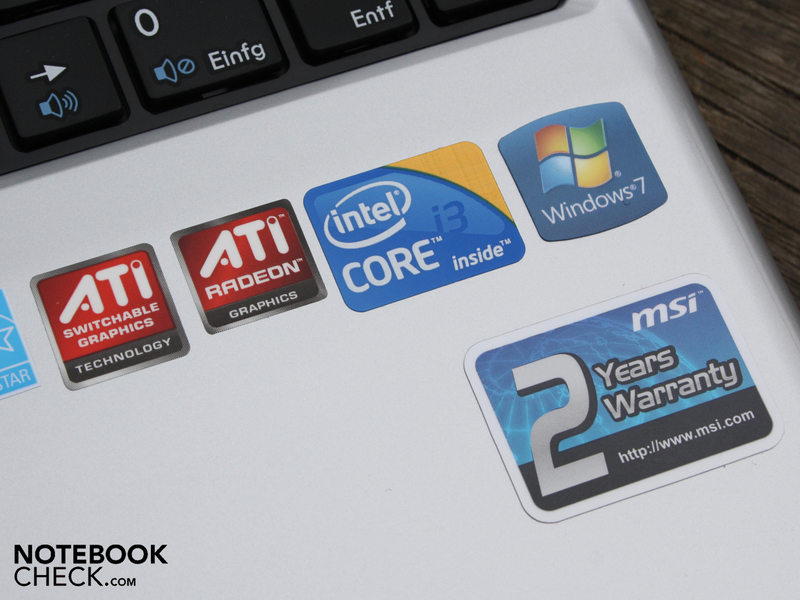 Contrary to other affordable notebooks by different manufacturers (review HP 625, 12 month return repair service), MSI provides a 24 months collect and return warranty. The keyboard of this all-rounder belongs in the category of just about usable. For those that write a lot it is however not suitable. When typing the keys display a short keystroke, and have a slightly unclear pressure point, as well as a bouncy end stop in some places. 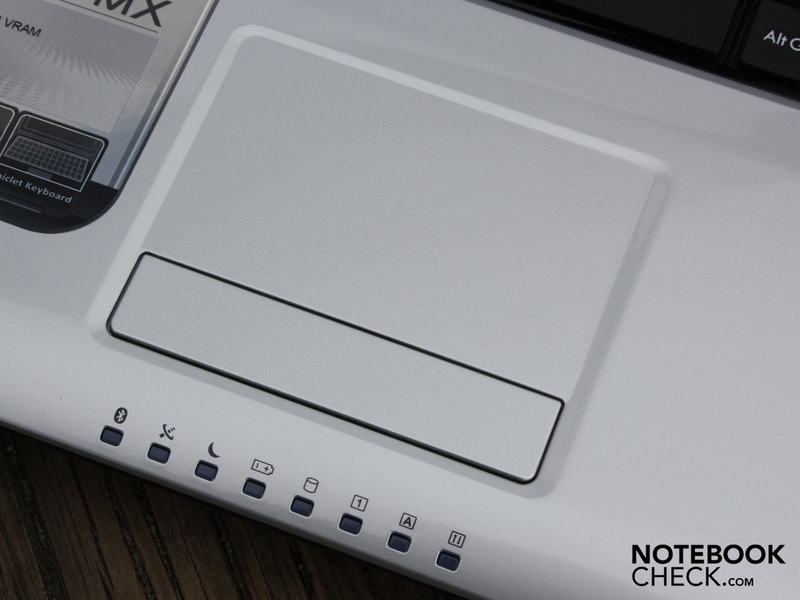 The statement by the manufacturer, that chiclet keys improve the typing accuracy, cannot be confirmed by us. The keys are relatively small compared to a standard keyboard, and tiny enter/right shift keys are the icing on the cake. There can't be any discussion about a generous layout. The arrow keys have been forced under the enter key, and next to the shift key, which leads to less typing accuracy in this area. To be praised is however the clear, and white labeling of the keys. An alpha-numeric keypad with the standard layout helps with entering numbers, and the operating of the calculator. Quiet typing is also possible, since the end stop only generates a faint and quiet sound. Unfortunately the Touchpad carries on the weak feedback. The Synaptics V6.2 is integrated into the palm resting area, and lies in a small depression, which doesn't have a high-gloss surface. 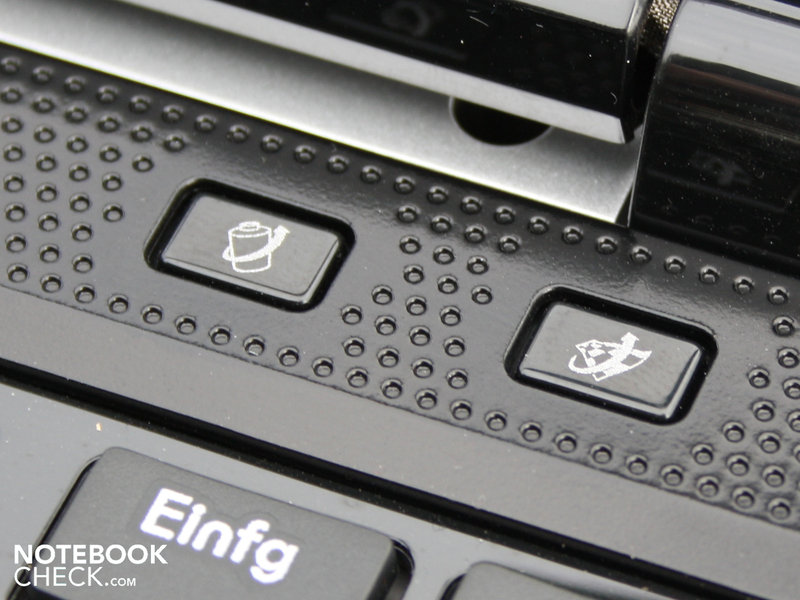 The cursor can be maneuvered precisely over the slightly slippery, and up to the edges sensitive Touchpad. The Synaptics V6.2 is not a multi-touchpad, the zooming with two fingers, or the turning of pages with two fingers is hence not possible. The zooming or rolling with a single finger over the horizontal and vertical scrollbars does work though. The most annoying thing are the two mouse buttons that lie in a depression. Both have a very short keystroke, that doesn't feel very pleasant, and trumps their pleasantly quiet clicking sound. MSI has integrated a WXGA panel with a native resolution of 1.366 x 768 pixels. The 16:9 display (Samsung 156AT05-H01) is not anti-reflective, and has substantial reflections in unfavorable lighting conditions. The contrast of the display is very low with 169:1. The measured black level value lies at 1.28 cd/m². The dark areas are not pitch black, as they should be on a good TFT. A gray shimmer is apparent, and also not improved by the color friendly glare type finish of the display. The display distributes the brightness very evenly over the whole panel (81%). There are still small differences visible with the naked eye. In the middle we measured a maximum value of 216 cd/m². On the right at the top the brightness falls to as low as 175 cd/m². The average lies at 191 cd/m², which is a less than average value. When it comes to the color space, the Samsung panel doesn't have any real advantages to offer, although it could be worse. Adobe RGB as well as sRGB can not be covered completely. In comparison to a display with extended color space (HP Envy 14), the CX620MX has to give itself beaten as expected. 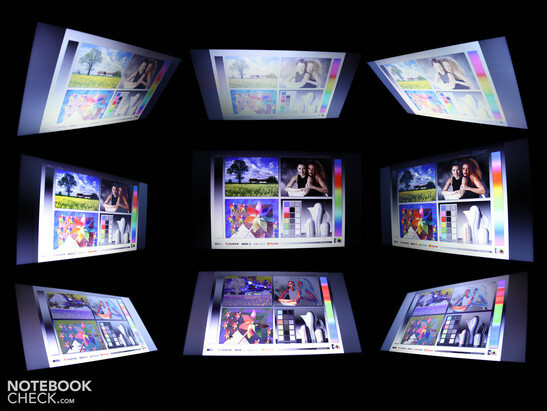 Generally this panel fits into the middle of the wide range of the mass of current affordable notebook displays. 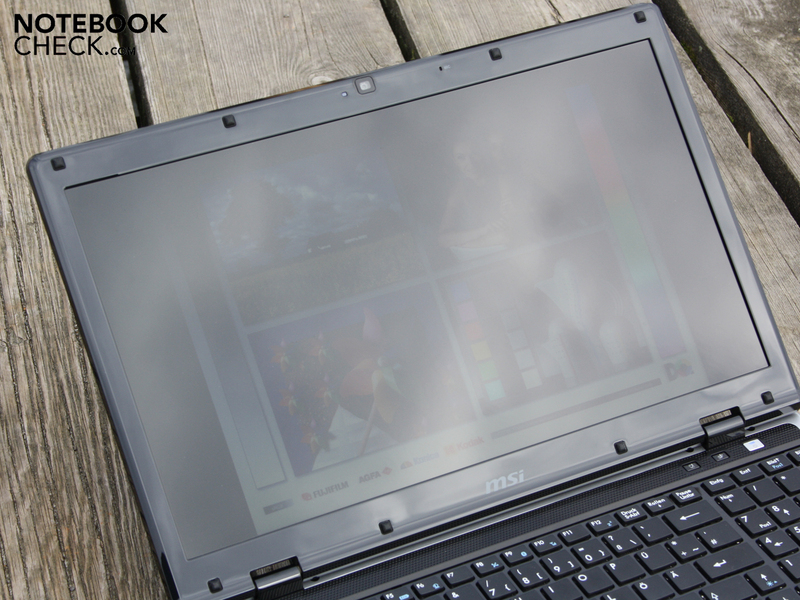 The display of the MSI CX620MX is not suitable for use outdoors for two reasons. The reflective characteristics and the low brightness have to struggle against the sunlight. Strong reflections prevent sight of the displayed images, depending on the ambient lighting conditions, and force the user to adjust the viewing angle, or to find a place in the shade. The outdoor photographs taken with maximum brightness show almost unrecognizable displayed images, which reflect the clouds. When it comes to the viewing angles, users only have a small amount of deviation from the center available of up to 45 degrees. Moving above or below (vertically) the ideal location in front of the display, leads to the colors clearly fading from about 15 degrees. The Intel Core i3-330M (2.13 GHz, 3 MB L2 Cache), is the lowest performance Arrandale processor from Intel. The newest sister model i3-380M (Arrandale refresh) is substantially faster with 2.53 GHz. The i3-330M has a processor integrated GPU, as well as a DDR3 memory controller. The Intel HD can be switched in favor of the dedicated ATI Mobility Radeon HD 545v (512 MB DDR3). 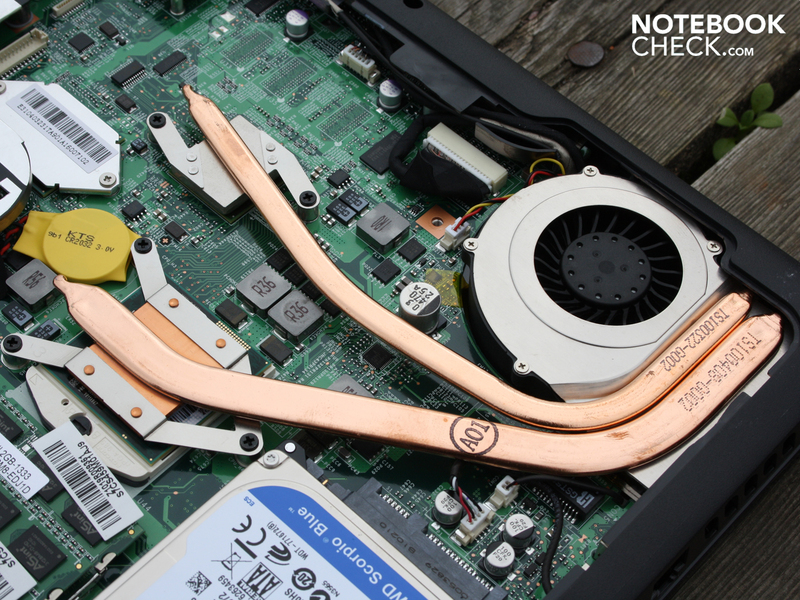 More on the HD 545v in the section on gaming performance. The purpose of the integrated energy saving graphics card is an extension of the battery life, by reducing the energy consumption. In this case the Intel HD in the i3-330M can still support HD decoding (MPEG2, H264, WMV9, VC1), as the HD 545v would as well. To assist the Core i3 there are 4.096 MB DDR3 SDRAM (2 modules). Contrary to the older Core 2 Duo CPUs from Intel, the Core i3 has Hyper-Threading (HT). HT provides one virtual core to assist every physical core available. The two core processor can hence work with 4 threads simultaneously. The difference between the i3-330M compared to the Core i5/i7: there is no Turbo-Boost. The Core i3-330M (2.13 GHz) works more slowly than its sister models i5-520M and i5-430M. The processor-test Cinebench R11.5 (64-bit) grants 520M laptops about 2.2 points, 430M CPUs get about 2.0 points. 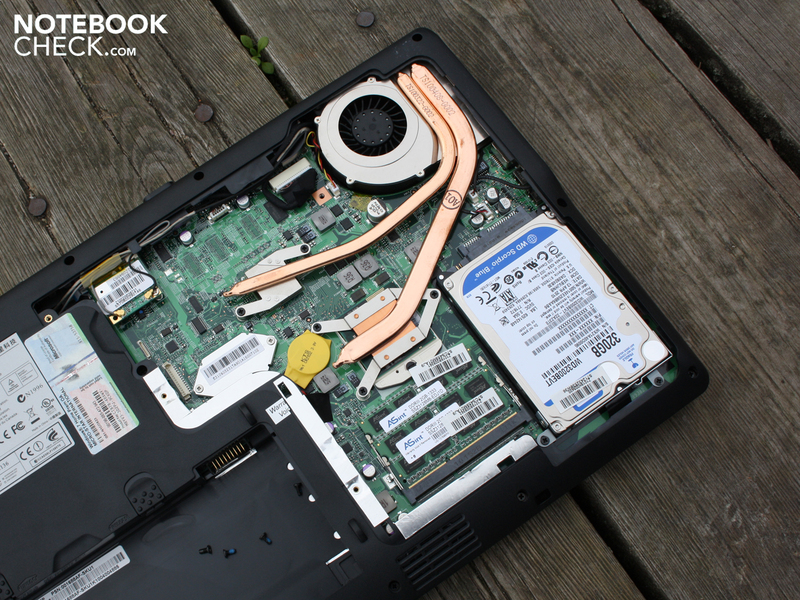 The i3-330M on this MSI notebook achieves significantly less than this with 1.76 points. The single core calculations with the 2.13 GHz of the i3-330M are not as potent as those of the faster i5-430M due to the lack of Turbo Boost. The last of which reaches up to 3.362 points (Cinebench R10 single core 64-bit, Sony Vaio VPC-EB1S1E/BJ). The 330M in the CX620MX achieves 2.909 points. 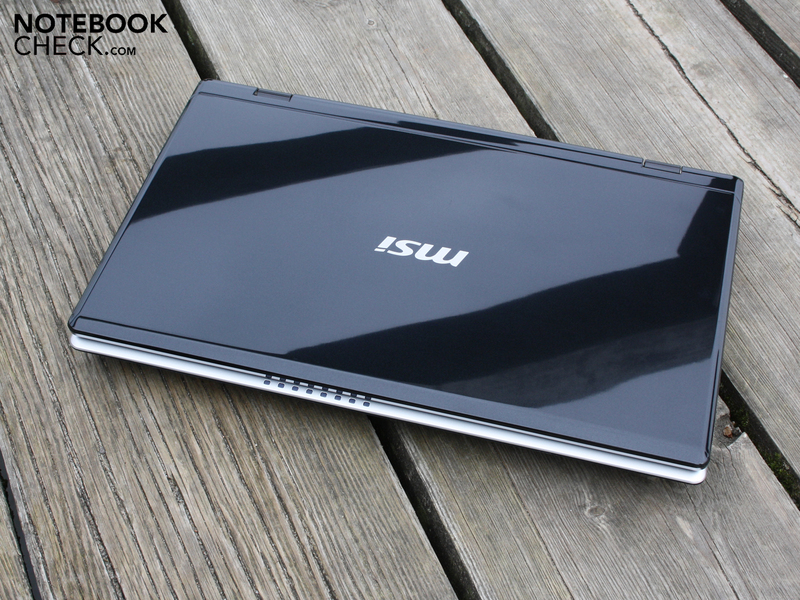 The Core i3-330M is an entry level component, but nevertheless not bad. The competition from AMD, such as the Phenom II X3 N830 (HP ProBook 6555b) is still easily blown away: 1.18 and 2.263 points (R11.5 CPU 64-bit and R10 single 64-bit). Performance orientated users are still better off with a Turbo Boost capable i5 processor though. The test of the system performance with PCMark Vantage gives an all together good result of 5.071 points. The test checks all the components, from the processor to the RAM and the hard disc. This is a comparatively strong value (compared to Core i5), which indicates the performance of the dedicated graphics solution. Other Core i3-330M systems with mid-range graphics (Toshiba Qosmio F60, Nvidia GT 330M) reach 4.552 points. Core 2 Duo processors from the past show that the i3-330M doesn't need to hide itself. The CPU should still be favored compared to the Core 2 Duo CPUs still available on the market, despite the higher price. 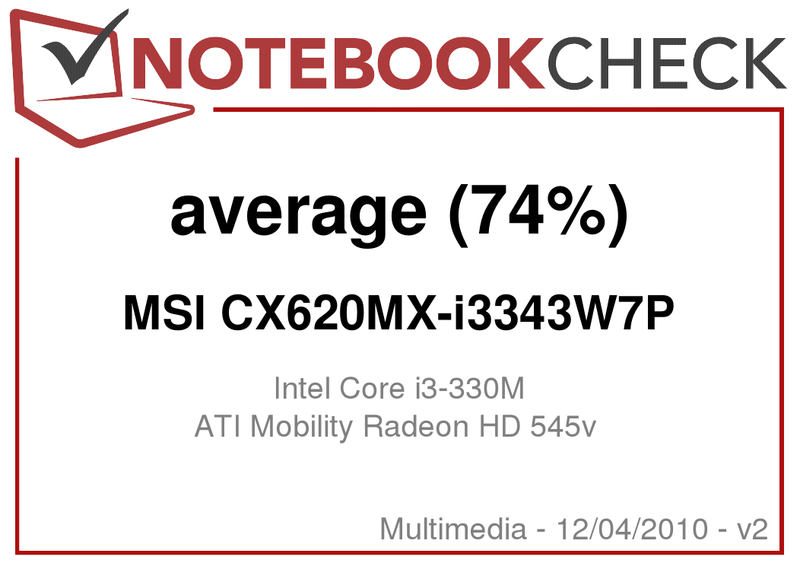 The MSI CX620MX works (with reference to the multi-core performance) faster than a Sony Vaio VGN-FW51MF (4.096), or a Acer Aspire 5935G (3.882) with the old high-end CPU T9550. When it comes to the single core comparison, the T9550 is better, but PCMark Vantage doesn't give this a great deal of priority. The Western Digital hard disc (type WD3200BEVT) with a total capacity of 320 GByte only has average data transfer rates of 65 MB/s (sequential read). Current notebook hard discs, also with 5.400 rpm, also reach 60 to 70 MB/s. Relatively high is the burst rate at 98 MB/s. This value describes the data volume that can be retrieved out of the cache of the HDD within one second. The Western Digital HDD can only be heard by its quiet humming, the read/write heads only occasionally make decent clicking sounds sporadically. 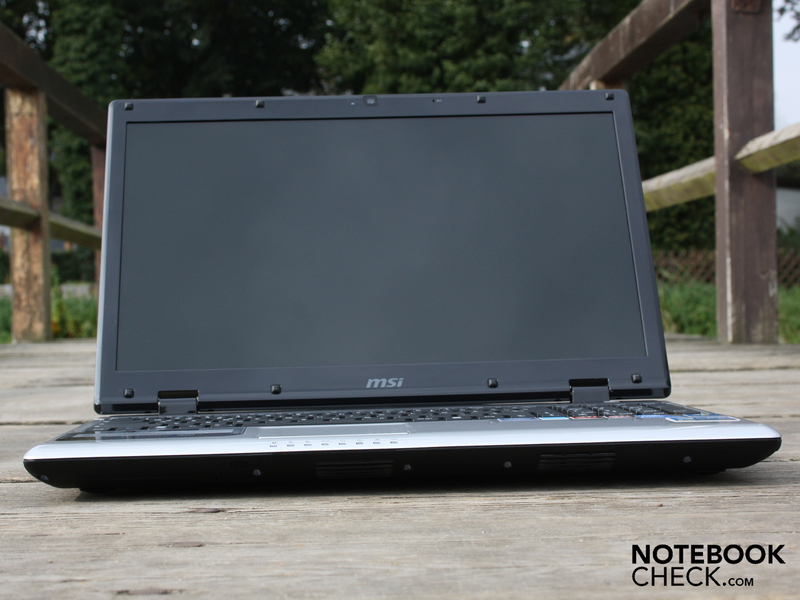 Does the CX620MX want to be a gaming notebook? The ATI graphics card HD 545v does not support DirectX-11, despite the '5' in its name, since we are dealing with an renamed Mobility Radeon HD 5145, which is a minimally higher clocked HD 4570. The memory has a clock speed of 720 MHz, and the core a clock speed of 750 MHz. This is not significantly different from the sister GPU HD 5470 (memory 800 MHz with DDR3, core 750 MHz), which is used in many mainstream notebooks. The latter of these is however DirectX-11 capable. Most DirectX 9 games at least let themselves be played smoothly with the HD 545v with a resolution of 1024x768 pixels and higher detail levels (e.g. Call of Duty 4, F.E.A.R., Unreal Tournament 3, World of Conflict). 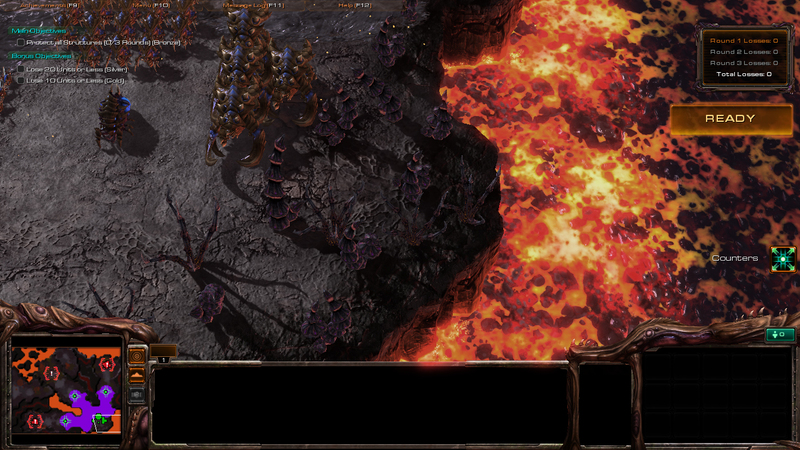 When it comes to demanding games such as Risen or StarCraft 2, the detail level has to be set to low however. The 3DMark06 shows its feable 3.689 points (HD 5470 3.702 points) in the weak performance domain. What current games have to say about this, the gaming fan can already guess. Demanding games such as: Bad Company, weren't even tested by us, since the already older FarCry 2 and Risen showed weak performance. The favorite StarCraft 2 only runs smoothly with the lowest detail settings, whereby the 122 FPS allow the resolution to be increased to the native 1.366 x 768 pixels. The four following gaming tests show: gamers cannot get very far with the ATI HD 545v. Current and also older demanding games shouldn't be on the wish list. For older games a la Left4Dead the performance is at least enough to use the medium settings. Those that want to play for little cost should pay a bit more and consider buying the Toshiba Satellite L670D-120 (from 760 Euros) or the Satellite L650D-10H (from 590 Euros). Both are equipped with the significantly better HD 5650 graphics card. When writing E-Mails, listening to music, or typing in Word, the cooling system runs with a constant speed at low revolutions. It never completely stops. We measured 31.5 to 32.4 dB(A) in operation without load. The hard disc makes itself noticeable with a decent clicking when in use: 32.5 dB(A). For office use the HD 545v was disabled. When testing games the cooling system turned significantly faster: 42.7 dB(A). The variations stay within boundaries, and the ventilation control makes a civilized impression. Only the stresstest (Furmark & Prime95) over two hours got the cooling system out of its steady operating state, and made it turn up to a noticeable 46.4 dB(A). 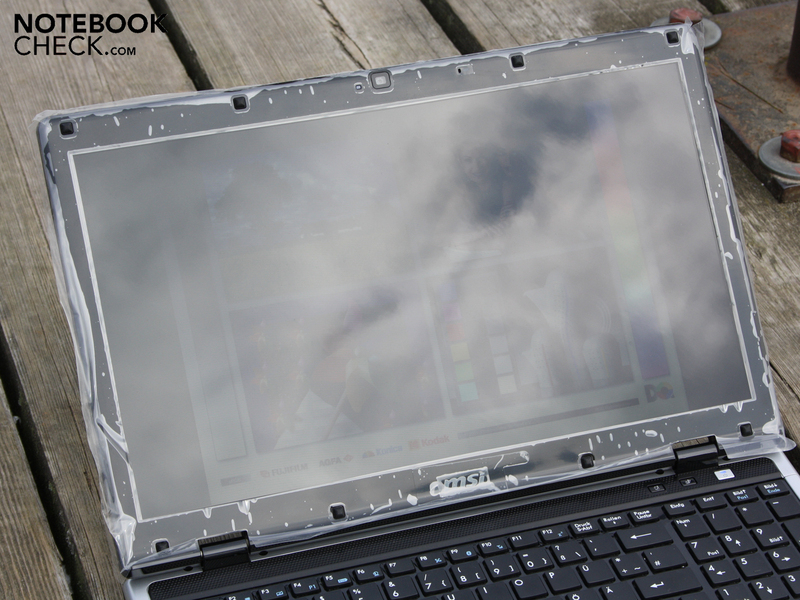 During word processing and surfing the web, the average temperature on the top surface of the notebook lies at 31 degrees. The palm resting area stays within a good range between 25 and 30 degrees. The bottom surface gets a little hotter, the maximum temperature reached was 38 degrees. Under a high load the temperature reading increased markedly. The infrared thermometer determined a maximum temperature of 48.5 degrees on the top surface during the stresstest. This causes warm fingers, since just about 42 degrees are also apparent on the keyboard. The bottom surface now reaches a temperature of 57 degrees around the area of the cooling vent. The air vent inlet should definitely not be obstructed under these conditions. (+) In idle usage, the average temperature for the upper side is 30.5 °C / 87 F, compared to the device average of 30.9 °C / 88 F.
(-) The average temperature of the palmrest area of similar devices was 29.1 °C / 84.4 F (-10.2 °C / -18.3 F). With respect to acoustics the CX620MX disappoints in every respect. The stereo loudspeakers are located under the palm resting area. From there they radiate onto the desktop. The sound that reaches the ears, is muffled and distant, as if the speakers were under a pillow. The sound processing (Virtual Surround etc.) cannot make much of an improvement to the mid-range characteristics of the frequency response. What is missing is clarity and balance. For the sake of completeness it is also worth mentioning that there are no bass frequencies audible, and also that the volume is low. A good piece of advice is to use an external sound system, which can be connected to the 3.5 mm jack socket output. The signal level from this output is not very strong. Large headphones with a relatively high impedance will not be pushed to their limits. At least there was no considerable noise or distortion introduced into the signal when we tested it with external loudspeakers (listening test - not measured). 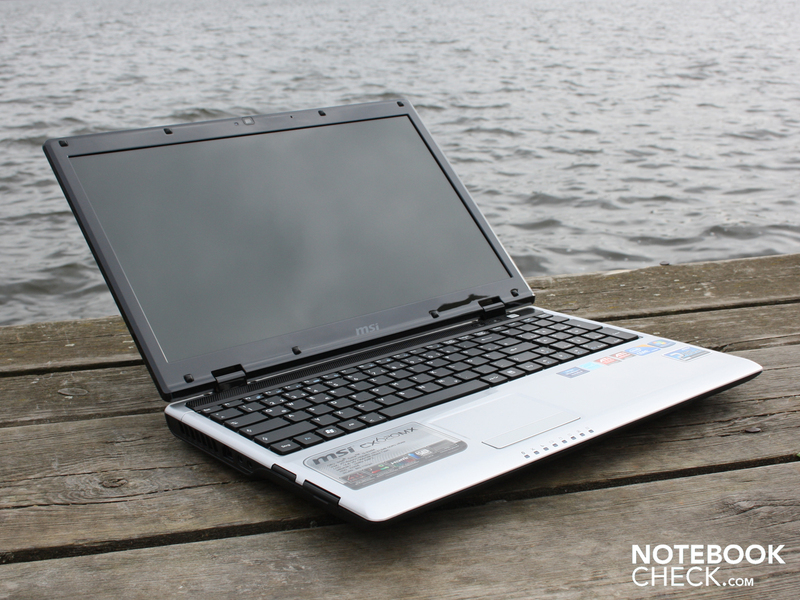 The hybrid-graphics had raised the hopes for a good battery life from this 15.6 notebook. With its 2:04 hours (124 minutes), the CX620MX can't gain any advantage though (WiFi test). This is where the high TDP (Thermal Design Power) of the 35 Watts Core i3-330M makes its contribution. This TDP, which combines the energy consumption of the CPU, Intel HD, and the memory controller, defines the maximum energy consumption of the chip. 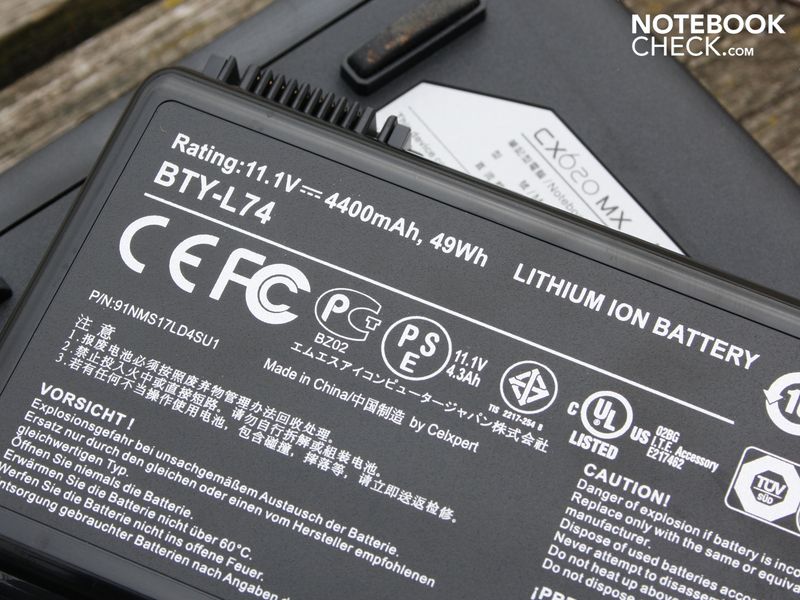 With BatteryEater Classic, the CPU is fully utilized, and lasts for 63 minutes (HD 545v enabled). Users can extend the battery life (idle battery life, BatteryEater Reader test) up to four hours (239 minutes). This is however not a likely scenario in day to day use. The lowest brightness is too dark to be usable, the WFi was disabled, and the processor utilization was approaching zero. A DVD movie can be watched for up to 154 minutes (2:34 hours). Those that do not disable the dedicated ATI GPU when the notebook is battery powered, by using the hardware buttons or the graphics settings, will get less than an hour shorter DVD viewing time (84 minutes). The ATI scenario wasn't tried by us for the WiFi scenario, but the battery life should also be about 50% shorter in this case. The 4.400 mAh battery (49 Wh) is only ready for the next movie after 2:26 hours (146 minutes). This is how long it takes to completely re-charge the battery. The energy consumption compared between the enabled and disabled ATI HD 545v, shows why the energy saving user should definitely leave the Intel HD activated. As far as all the energy saving options are set, and the brightness is at its lowest level, the idle energy consumption lies at 15.3 Watts. 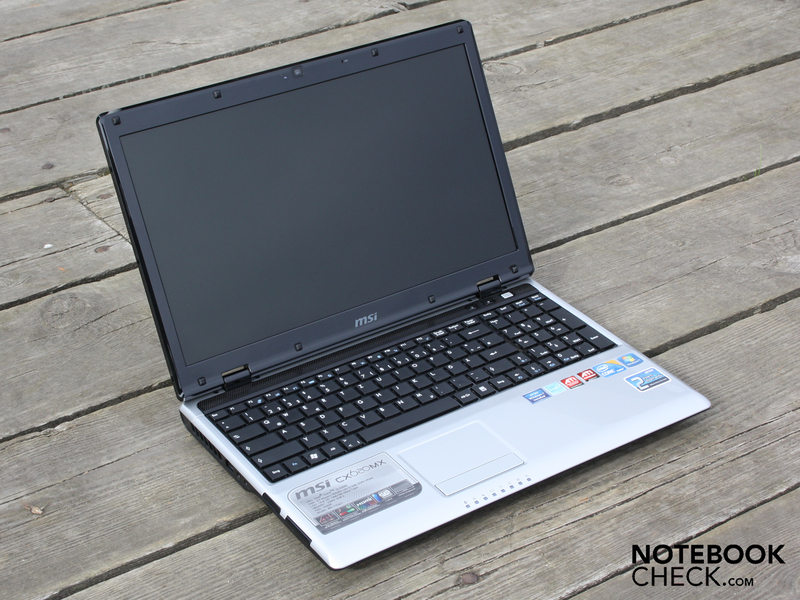 An Acer Aspire 5741G-334G50Mn is markedly more frugal with the same CPU and a similar GPU (HD 5470) at 10.5 Watts. Realistically users will however have to expect an energy consumption of between 26 and 30 Watts during office use. 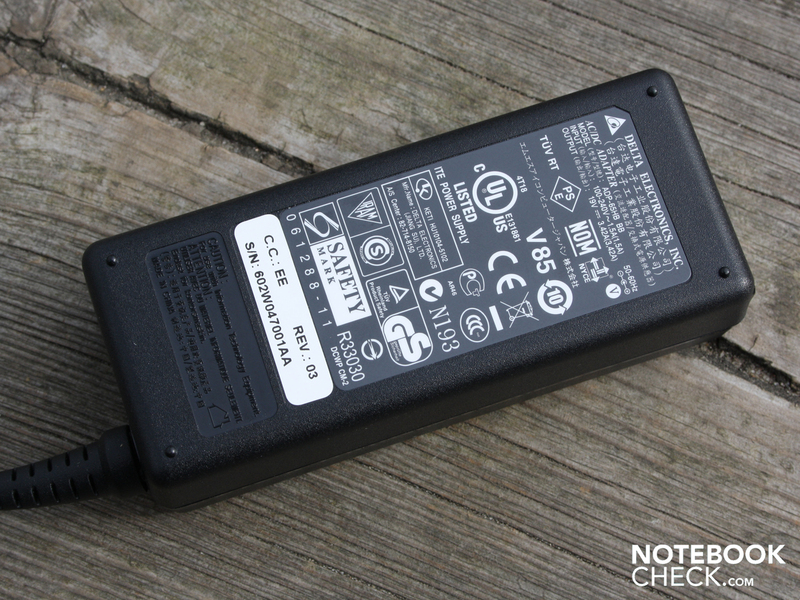 When the ATI HD 545v is used as standard and the notebook power adapter is plugged in, the minimum idle energy consumption already lies at 26 Watts. This means an increase of 11 Watts, and a comparatively high energy consumption for a notebook with altogether weak CPU and GPU (lower mid-range) performance. Depending on the energy settings (mode high-performance etc.) the idle energy consumption can also lie at 30 Watts. 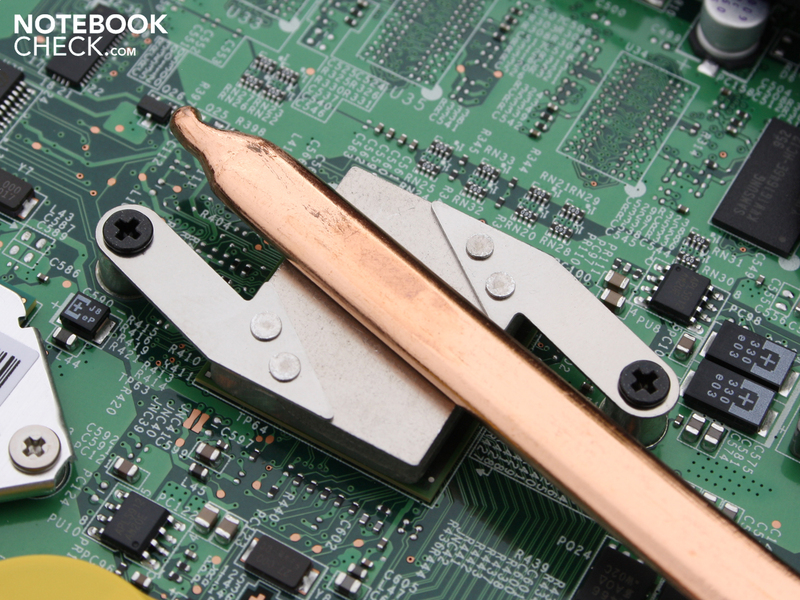 When the ATI HD 545v is occupied with a 3DMark2006 test, the effective power rises to 54 Watts. The maximum energy consumption was measured by us using a stresstest (Prime95 and Furmark). The multimeter showed 65.6 Watts. This could get tight for the small 65 Watt power adapter, which heated up to a noticeably high temperature of 63 degrees during this level of power consumption. The stresstest with maximum utilization of the CPU and GPU is however an unrealistic scenario, which is why potential buyers need not have any qualms. 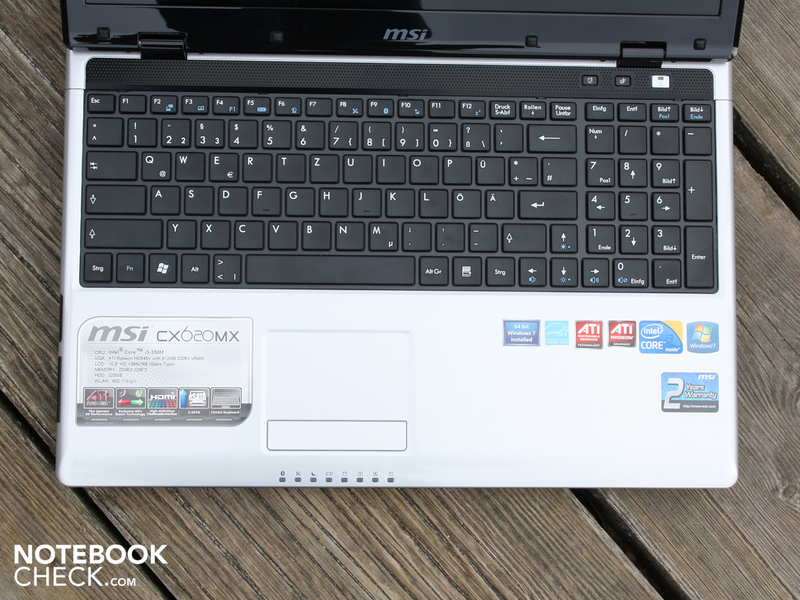 The MSI CX620MX with a Core i3-330M (2.13 GHz) wants to be an all-rounder with media ambitions. As far as the application performance is concerned this is achieved satisfactorily, we experienced solid Core i3 performance. Less solid was the entry level GPU ATI Mobility Radeon HD 545v. The processing of current 3D games is not smooth enough, at most with the detail level and resolution at their lowest levels. Those that want to play games seriously should not take the HD 545v into consideration. 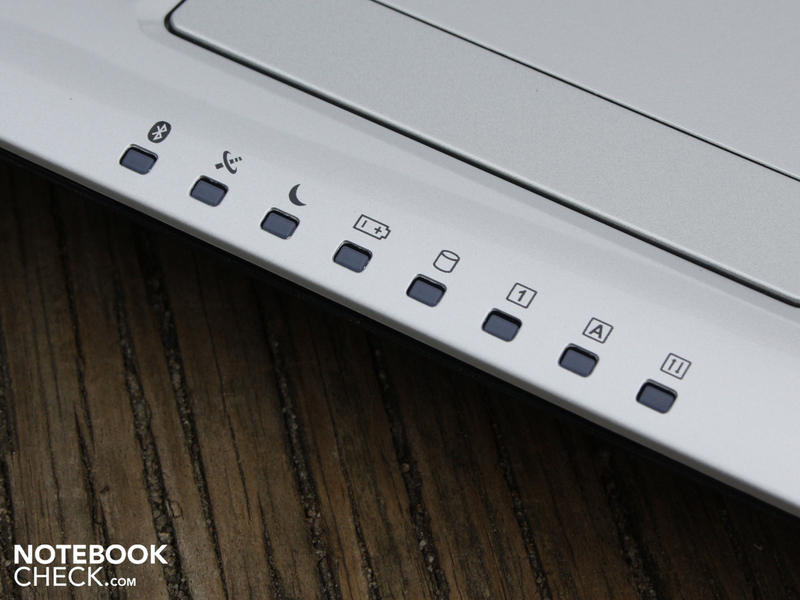 The battery life of this 15.6 inch notebook lags behind our expectations. Two hours when surfing the internet with WiFi, or just about three when playing back a DVD are acceptable, but not especially good in light of the disabled HD 545v. The cause for this is the high energy consumption, which is about one third higher in idle mode with active Intel HD, than other 15.6 inch notebooks with dedicated GPU (15.3 Watts). With activated ATI GPU, the energy consumption even lies 11 Watts above more powerful notebooks with Core i5, and HD 5650 (15 vs 26 Watts). The CX620MX has, within limits, only few advantages. Among these are the good interfaces (eSATA, ExpressCard34, HDMI). 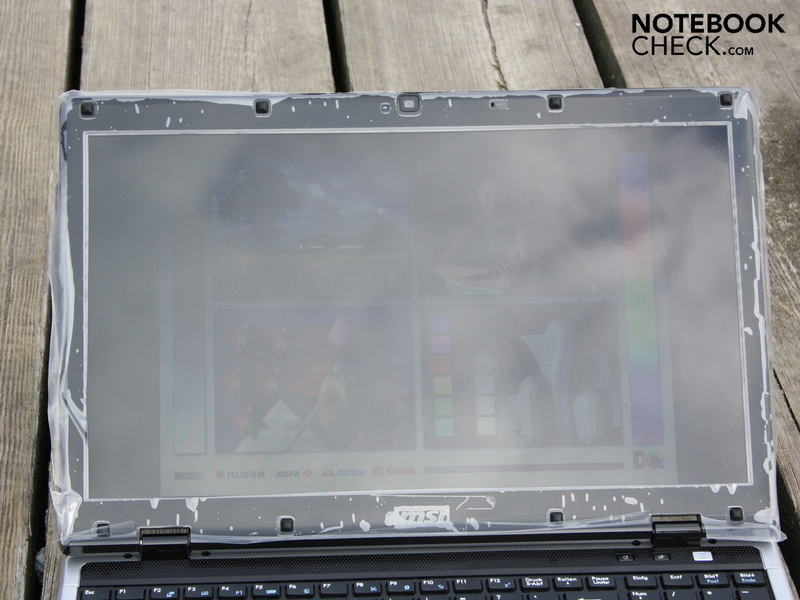 Those that leave their notebook parked on the desktop for the majority of the time, and use an external display, as well as connecting an external hard drive via eSATA, will be pleased by the clear desk surfaces. 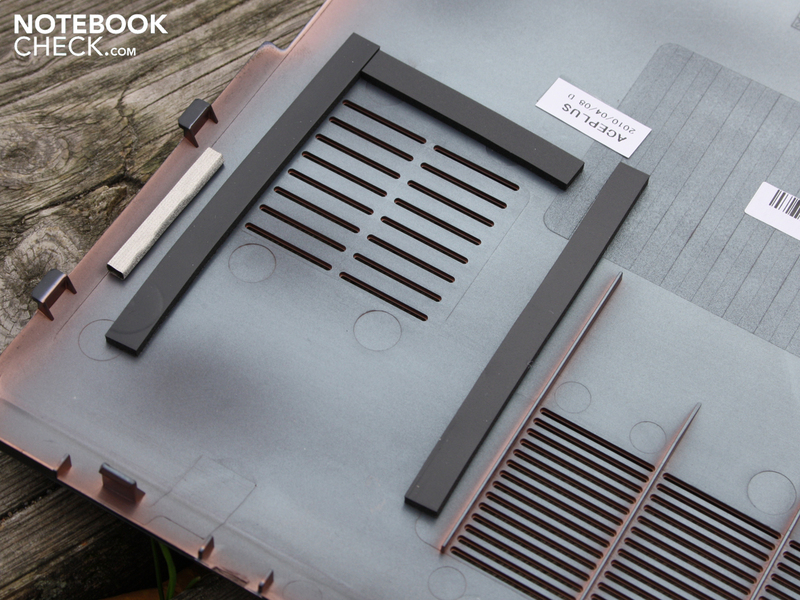 Most of the interfaces are located at the rear of the notebook, just like in old times. The construction is sufficiently stable, but leaves a low quality plastic impression with all its high-gloss surfaces. The ergonomics show disadvantages from the the heat dissipation under a high load. Also not favorable is the bad feedback from the buttons on the non multi-touchpad. Frequent typists will not find these, or the bouncing and partially bunched together keys, pleasing. 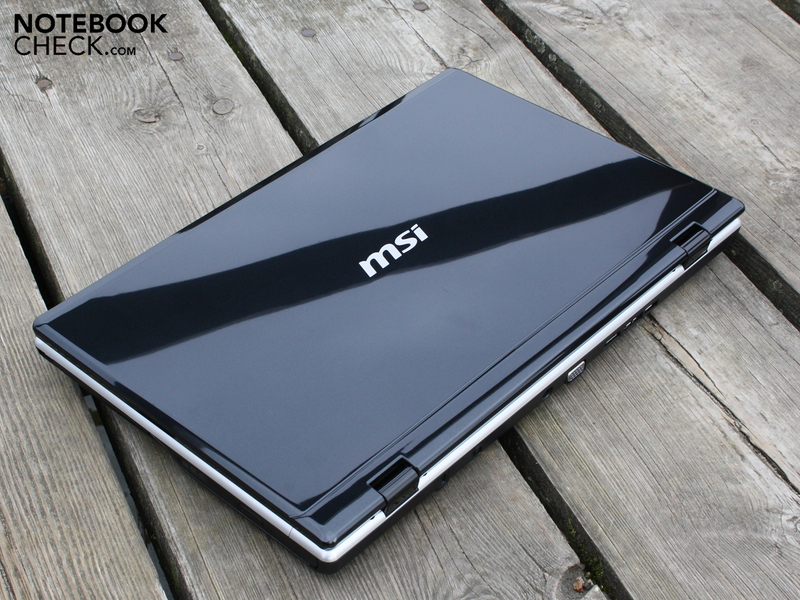 The CX620MX by MSI is a Core i3 all-rounder with Radeon HD 545v graphics. The rear also stays clear, because the base plate has the battery under the palm resting area. 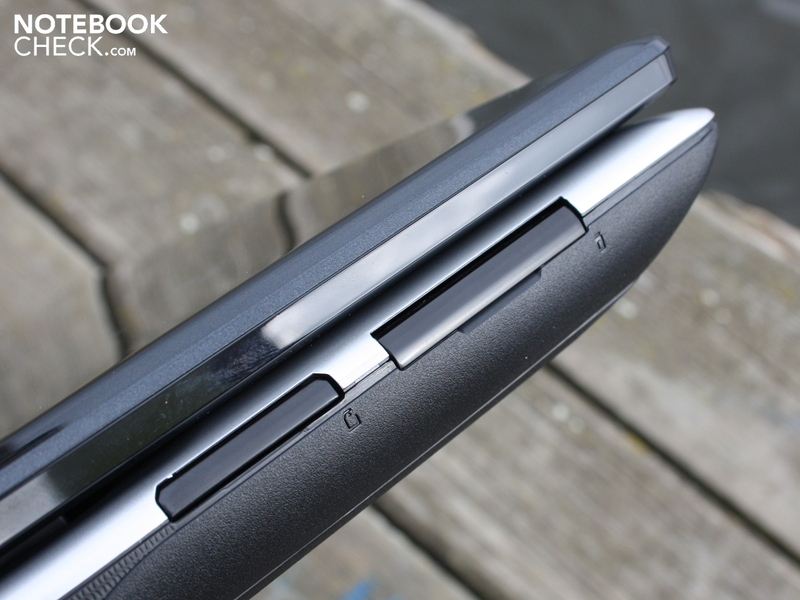 The battery only keeps the 15.6 inch notebook on its feed for two hours, despite the Intel HD (WiFi - surfing). This is also due to the low capacity of 49 Watt-hours. Breaking the seal makes the 24 months manufacturers warranty expire. This doesn't prevent us from taking off the maintenance panel though. CPU (left bottom) and GPU each have a heat sink. The yellow cover hold the CMOS battery. 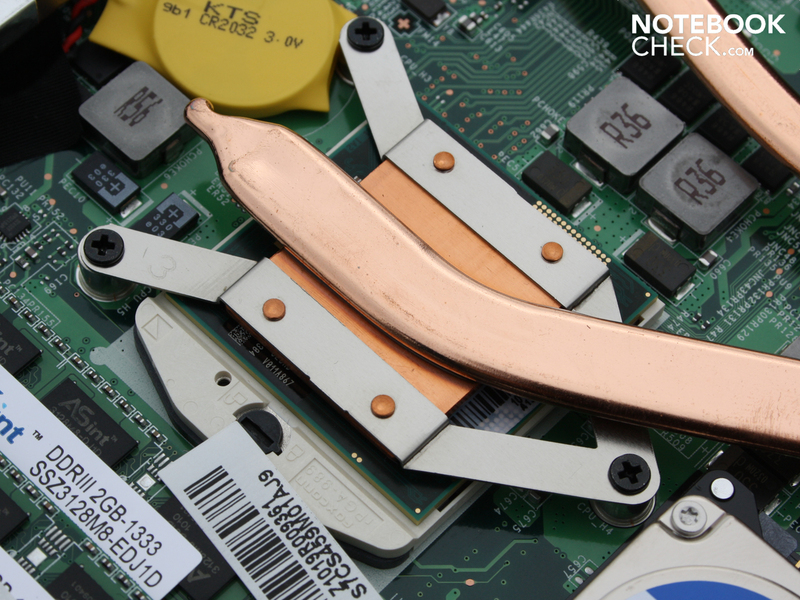 The Western Digital hard drive sits directly between the other components. The HDD is merely cushioned by this provisionally attached piece of rubber. Both of the RAM modules are now easy to reach. The Core i3-330M (2.16 GHz) is also plugged. There could also be an i5-430M here (CX620MX-i5447W7P). The WiFi module by Atheros is plugged into the mainboard as mini PCI Express. The small power adapter weighs a mere 400 grams. Here there is also the Kensington lock, as well as a sealed hole. 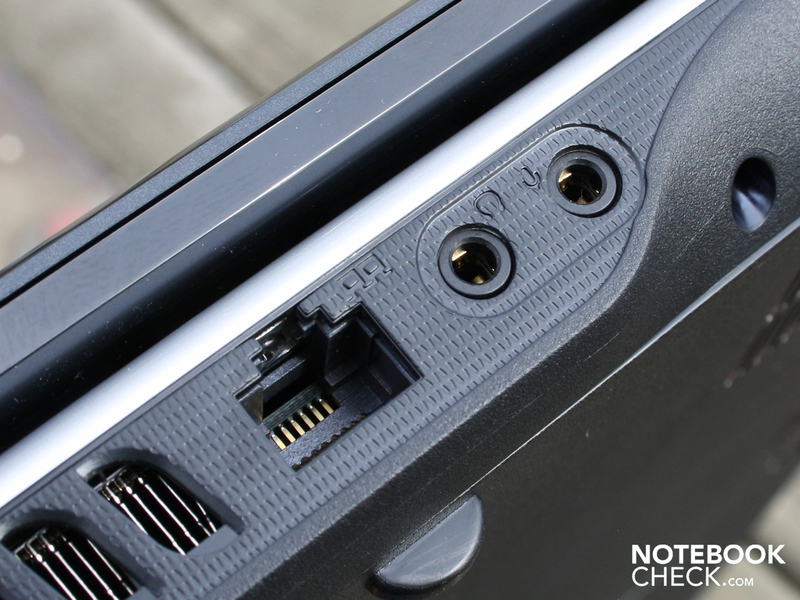 The bulky VGA, HDMI, and eSATA cables, as well as USB are located at the rear. 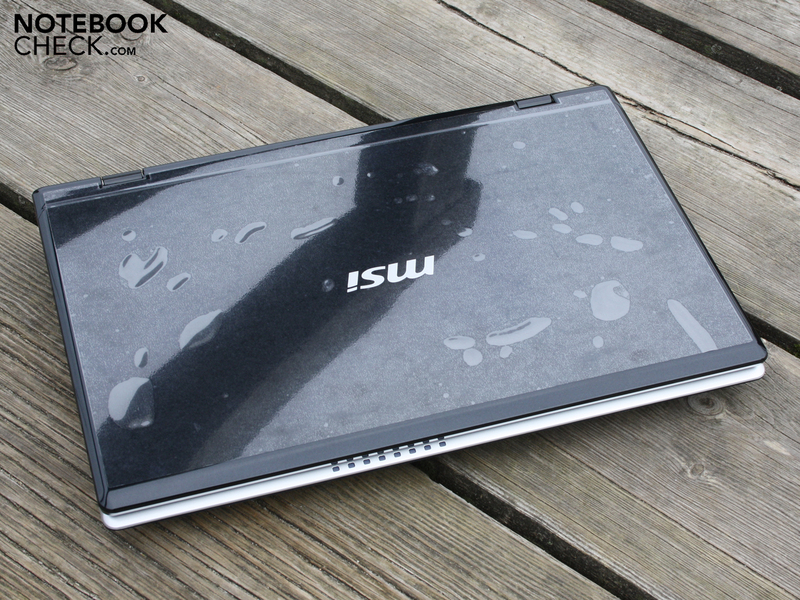 The case shines everywhere, as well as on the 15.6 inch TFT. The display is too dark and reflective for sunlight. For under 600 Euros buyers get an ATI GPU along with the Intel HD graphics. The HD 545v in the CX620MX can be disabled with the push of a button. 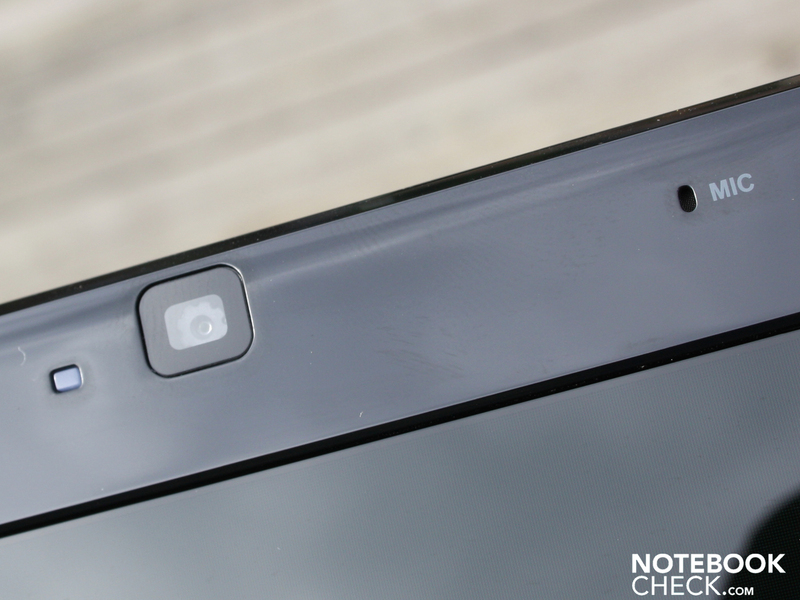 The case is everything other than 'thin and light', as the manufacturer claims. 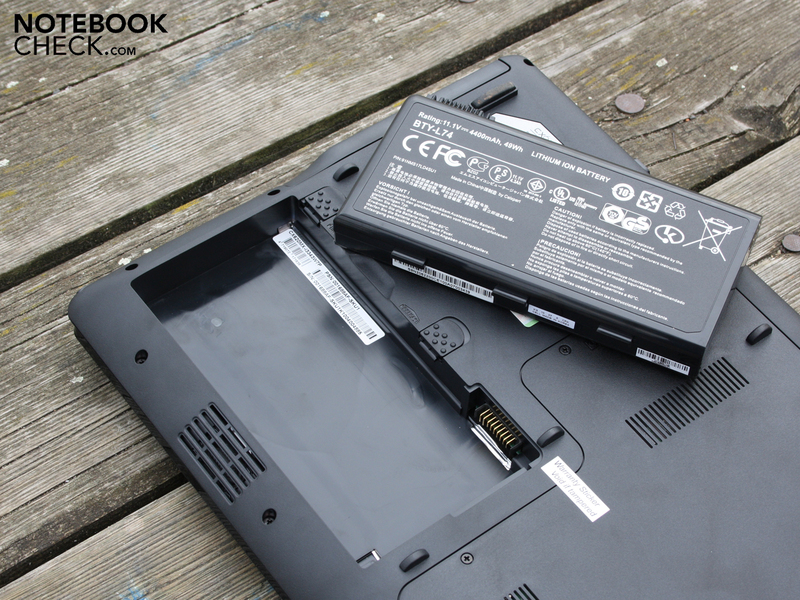 2.44 kilograms including the battery, is however normal for a 15.6 inch notebook. But not any more, the first finger prints are already waiting. 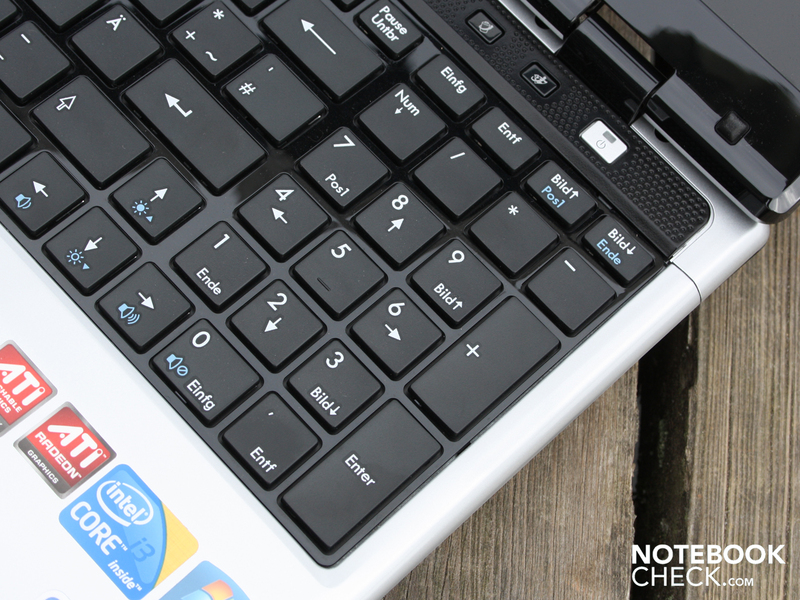 The gloss doesn't stop with the chiclet keyboard. Which is also why the areas between the keys are also reflective. The details on the case are pragmatic and simple. Here for example, the restrained air vent opening. Praising words for the interfaces on the CX620MX. It provides 65 Watts, and appears to be over-exerted at full load: 63 degrees Celsius (stresstest). At last interfaces on the rear. This provides for order on the desktop. A matte palm resting area, and better input devices would have at least made the CX620MX a useful office partner. Hybrid-graphics without energy saving advantages? This shot backfired. Even a 15.6 inch notebook with single HD 5650 is more economical in idle. Acer Aspire 5741G-334G50Mn: with Radeon HD 5470 and slimmer look; Sony Vaio VPC EA1S1E/W: similar configuration with HD 5145; Acer Aspire 4820TG-434G64Mn: HD 5650 with 14 ich display; Acer Aspire 5551G: with AMD triple-core; Samsung P530 Pro: better office; Fujitsu LifeBook A530: more affordable Core i3 office; Lenovo IdeaPad Z565-4311: higher quality; Lenovo IdeaPad G560: more affordable office.